Michael Rees has experimented with combining digital technology and contemporary themes with sculpture for 20+ years. The objects he creates are always the starting points for a rich interactive experience. In his latest exhibition — Synthetic Cells, he explores materials by using inflatable installations with an overlay of augmented reality to challenge the viewer to question how the boundaries of our physical and digital experiences converge. Rees also created the digital overlays for work by other artists who will collaborate for Site (Para) Site, the augmented reality portion of the exhibition. Marc Fornes, head of art and architecture studio The Very Many specialises in “the intersection of unique spatial experience and ultra-thin lightweight structures”. At this year’s Jinji Lake Biennial, he installed a large-scale, aluminium outdoor pavilion on the elevated plaza of the Suzhou Center. 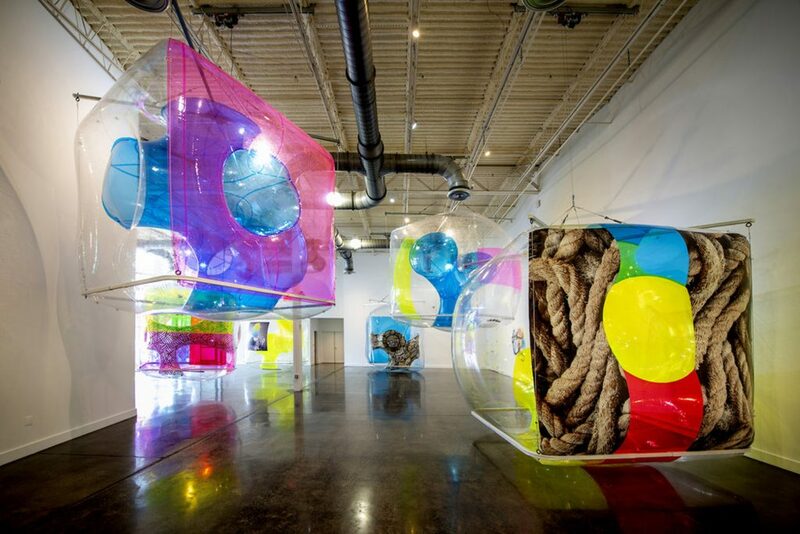 The installation (above), entitled Boolean Operator after the function that determines relationships between statements, geometries or forms, appears to be bubbling up from the ground or to have been dropped from the sky. Designed to make an impression from a distance, it is totally at odds with the surrounding texture of the city. The doubly-curved surfaces, just 2mm thick and punctured with holes, cast no regular shadows, giving little information to the eye to perceive the scale or depth of the structure meaning the only way to understand the space is to move through it. If you happen to be in Mexico City then be sure to pay a visit to KnitCandela (above) from Zaha Hadid Design. 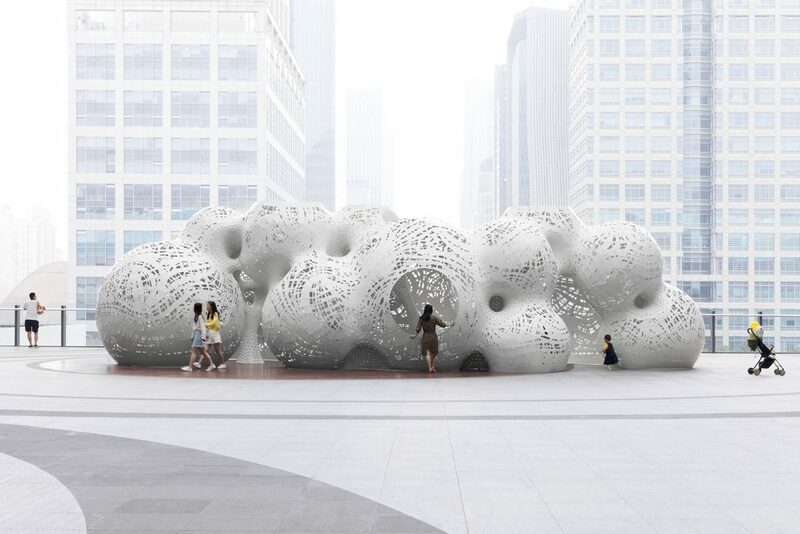 It is a collaborative design project between ZHA and the Block Research group of ETH Zurich. The research and development of the KnitCrete formwork technology, structural design, form finding, engineering and analysis were responsible by the Block Research group of ETH Zurich. 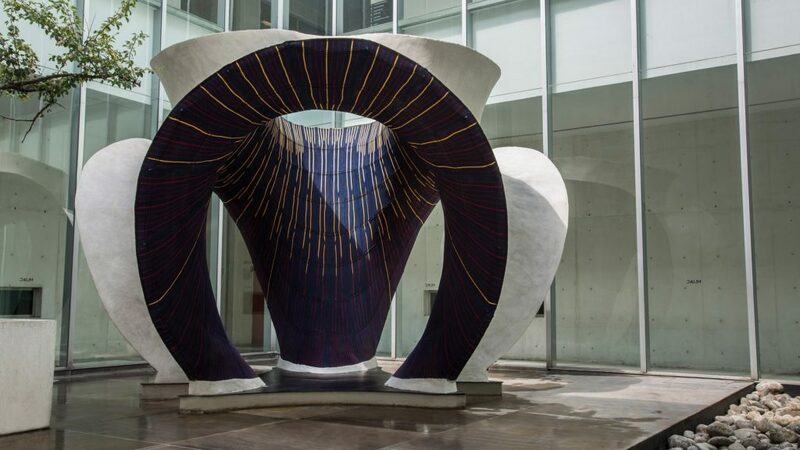 It is a thin, sinuous concrete shell with a surface area of almost 50sq m and weighing more than five tonnes, built on an ultra-lightweight knitted formwork, apparently transported to Mexico from Switzerland in a suitcase! The piece forms part of the practice’s first exhibition in Latin America and is intended to pay homage to the Spanish-Mexican architect and engineer Felix Candela by reimagining his concrete shell structures. The design, says the studio, is inspired by the colourful traditional dress of Jalisco, Mexico and was designed and constructed by multiple teams in Europe and Mexico.